Pub staff went from pulling pints to solving crime when they used Facebook to track down a burglar who broke in and stole a laptop. 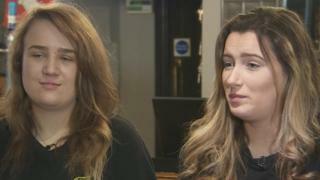 Jade McHugh and Beth Jolley of The Squire pub in Blackburn, Lancashire, found the culprit after spotting the item listed on the site after the raid. Ms Jolley said she was "proud" she had helped police catch Dion Jamie Lucas. At Blackburn Magistrates Court' Lucas, 26, admitted burglary and was jailed for 14 weeks. Lucas, of Accrington Road, Blackburn had listed the laptop for sale for £1,234 on Facebook Marketplace after carrying out the burglary in August. He had posted it publicly and also showed his location on the listing, the court heard. Following the sentencing, Ms Jolley said: "I was quite glad I'd managed to find him, I was a bit chuffed with myself." She added the police told her two days after she sent them the information the suspect had handed himself in. Ms McHugh said the theft was "comical". "I was very shocked that they had put it on so quickly and so public. I did doubt that it might not be him because it was a bit silly but I'm glad that it was," she said.